Home » News » May Day…an Immigration Issue? May Day (May 1) is not a holiday usually celebrated or observed in the United States. Its origin is from European Pagan roots, yet it has significance for Americans because of the reform efforts in the United States to demand equality in the work force. It is probably the day of the year with the most holidays! It’s a celebration of Spring. It’s a day of political protests. It’s a neo-pagan festival, a saint’s feast day, and a day for organized labor. In many countries, it is a national holiday. For the ancient druids of the British Isles, May 1 divided the year into two halves and was celebrated with fire rituals during the Feast of Beltane and included fertility symbolism. For the Romans who later occupied Britain, it was a time devoted to the worship of Flora, goddess of flowers. By the Middle Ages all English villages had a maypole around which they danced. Villages competed to have the tallest maypole which was cut from a tree brought to the village from the forest. The cutting of the tree and the lopping of its branches unites the Celtic and Roman traditions. Going into the woods to gather flowers and greenery to celebrate the start of spring was referred to as “going a-maying.” In 1644 the Puritans put an end to the Maypole tradition. It was revived, however, under the Stuarts. In France it was King Charles IX who, having received a Lily of the Valley May 1, 1561, decided to offer Lily of the Valley flowers to the ladies of his court each year on May 1. Around 1900, men started to present a bouquet of Lily of the Valley flowers to women to express their affection. The tradition of offering a “muguet” or Lily of the Valley on May 1 continues in France and Belgium (the government does not tax the buying and selling of these flowers on that day), and it is a token of appreciation between close friends and family. May 1 is an observed public holiday there, and is also know as La Fete du Travail (Labor Day). In England the 1st Monday in May is a national holiday. 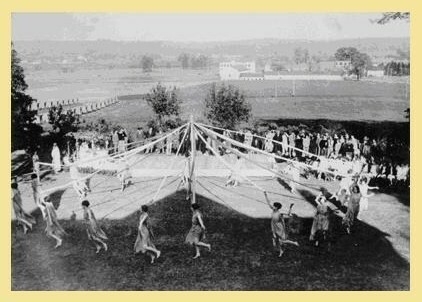 The Maypole dance still a ritual in many towns along with the crowning of a May Queen and Morris dancing.